Well it’s conference championship week, and this will be our last preview of the year until bowl season. I know it’s a little sad, but bowl season is right around the corner and we will be covering the games in full detail. Ross and I kept to our usual last week by picking lots of outright winners to win by more than they actually did. I managed and 8-3 outright and 5-6 ATS record, with Ross going 7-4 and 2-9, respectively. Season totals stand at: Sam 76-41 outright and 50-66-1 ATS, Ross 69-42 outright and 33-76-2 ATS. Oregon might want to follow Alabama’s recipe for revenge this week, although I highly doubt they will attempt to emulate their pass defense. Arizona has beaten Oregon twice in the last 13 months, and the Ducks would love to get over the Wildcat “bump in the road” much like they did against Stanford earlier this season. The Wildcats won’t give it to them though, and they have a guy named Scooby on their team who is really good. Oregon’s offensive line is a little bit healthier than it was earlier in the season though. Speaking of the Oregon offensive line, if the Ducks are to win this game then they will need to give their soon-to-be Heisman winner time to throw and space to run. I am, of course, referring to Marcus Mariota. Defensively, the Ducks have to find some way to slow the balanced Wildcat offense. I’m not sure the best way to approach that, but I believe it begins with pressuring Anu Solomon. The Wildcats need to do what they did earlier this season. This includes heckling Mariota. Mariota is fantastic, but if he spends the whole game on his back he can’t do that much. They can get some points with their bevy of talented pass catchers and ball carriers, but will it be enough? 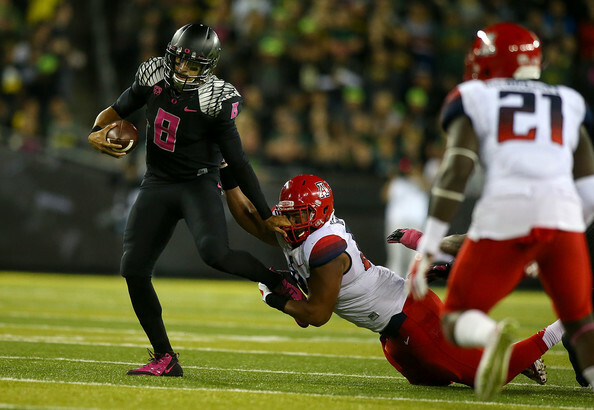 The Wildcats have had the Ducks’ number in the last 2 meetings. Heisman frontrunner Marcus Mariota has put up big numbers in the previous meetings, but turnovers and an inability to run the football has ruined Oregon’s chances at victory. Is the 3rd time a charm for Oregon? I think so. The Ducks get it done 41-31. Will Missouri ever not be underrated? At 10-2, and now back-to-back SEC East champions, they have gotten no respect this season. Is it because they lost to Indiana? Probably. Is it because they’ve been terribly inconsistent? Definitely. As a Georgia alum, I know most of Dawg nation is disappointed to see a team they shut out go to Atlanta instead of them, but the Tigers earned it. Alabama comes in after a topsy-turvy game against Auburn, but man that offense looked good in the 2nd half. Maty Mauk needs to play a phenomenal game for Missouri to have a chance. Most of Alabama’s losses since 2010 have come against Heisman winning quarterbacks or quarterbacks who have career games. 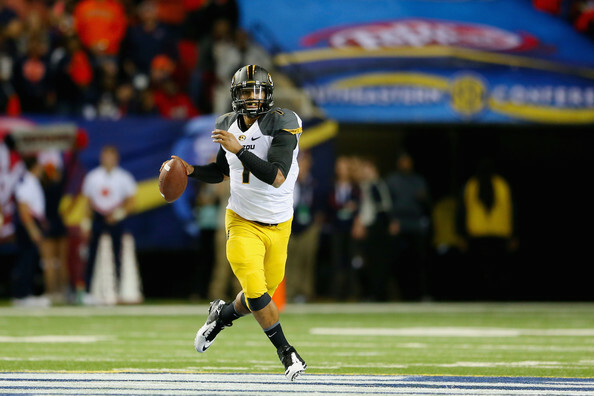 Mauk isn’t a Heisman caliber quarterback, so Tiger fans need to hope for the latter. He has been good in spurts this season though, and he does have talent. Defensively, the Tigers need to focus on containing Amari Cooper. He was out of control in the Iron Bowl. They also should be slightly worried about the makeup of their front. Markus Golden and Shane Ray are excellent pass rushers and will give Blake Sims issues, but I worry that they aren’t big enough up front to prevent Alabama from imposing their will in the running game. Missouri once again is the team that represents the East, but no one has talked about them. Their front seven can really rush the passer. But, Alabama has really been clicking on all cylinders lately. Auburn showed the way to beat Alabama last week, and that is to attack them through the air. I don’t think Mizzou has the perimeter players to do that. When Nick Saban smells blood in the water his teams usually dominate. That blood is a birth in the College Football Playoff. I have a gut feeling that this one could get ugly. Alabama 42-10. It’s really disappointing that the Buckeyes won’t have J.T. Barrett in this game. These are two teams that I think more highly of than pretty much anyone else outside of Columbus and Madison. Wisconsin is undefeated since incorporating Joel Stave into their quarterback mix, including a 35-point beat down of Nebraska and a double-digit win over a good Minnesota team. Melvin Gordon has had a lot to do with that success. He is ripping it up, and will finish in the top two of the Heisman voting. Ezekiel Elliott is no slouch carrying the ball either. J.T. Barrett was a legitimate Heisman candidate before his injury, and should still get invited in my opinion. The biggest thing for the Buckeyes is to get Cardale Jones comfortable early. There are two surefire ways to do this: run the ball effectively to avoid long passing downs and to complete some easy throws early. If the Buckeyes can do this, then they stand a good chance to win. If the Badgers can badger Jones early then it may be a long day. Wisconsin needs to do just that, and try to get Cardale out of sorts from the get go. Offensively, Gordon is probably going to get his, but I’m sure he wouldn’t mind if they could get some semblance of a passing game going either. They have run the ball around 300 more times than they’ve thrown it this season. #balance. Melvin Gordon is good. And I mean really good. 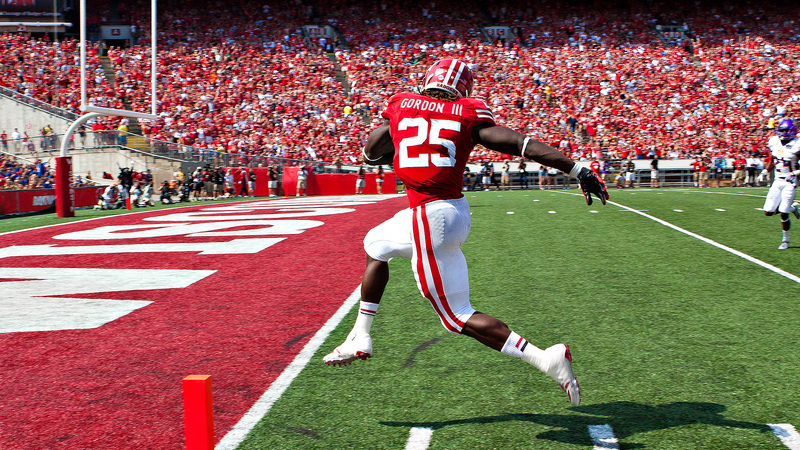 The Badger running back already has 2,260 yards rushing and 26 touchdowns. That’s ridiculous. He’ll definitely be invited to NYC and be a Heisman finalist. I really liked the Buckeyes the past couple of weeks, but the loss of J.T. Barrett really hurts. Wisconsin’s ground game is just too good and without Barrett, Ohio State loses a major playmaker. I like the Badgers 28-24. Jameis struck again last Saturday. He played very poorly in the first half and his defense absolutely bailed him out. However, the Seminoles/Criminoles/Free Shoes University just keep finding ways to win. Some people would suggest that continuously having to pull out 4th quarter comebacks indicates that they aren’t as good as the record shows and they are due to lose soon, and that’s certainly possible, but it also means that they are “battle tested”. In a tight 4th quarter game, they know what to do, and you can bet they won’t lose their heads. Hate ‘em or absolutely loathe them (because no one loves them), Florida State just keeps getting it done. When a team wins this many games in dramatic fashion it gets to the point where you just say this team is just a team of destiny and will win no matter what. The triple option attack from Paul Johnson and the Yellow Jackets requires lots of discipline and correct reads on your keys. But if they get behind this is not a great passing team. 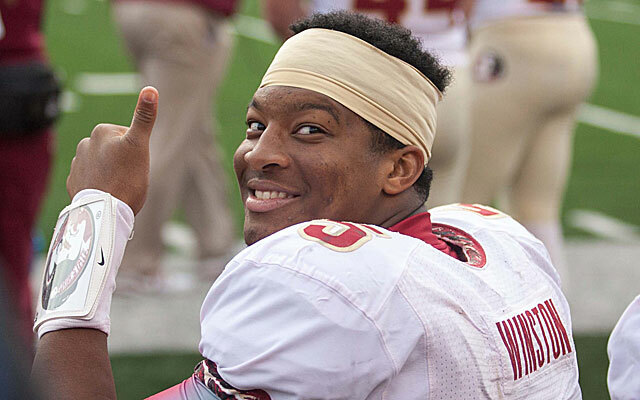 I think Jameis crab walks his way into the end zone a few times and leads the Criminoles to the win. “Florida State owns Georgia Tech. Always has. Always will”. Free Shoes 35, Rambling Wreck 24.